This so accurately describes my feelings when I get out into the wilderness where the flow of nature’s seasons carves the landscape so very differently every year. It becomes so new and fresh all over again that when I get back to where I started it feels like the first time. I have read that if you surround your senses in nature, the creative juices will begin to flow. Add to that an historical aspect nudging your imagination to journey through time to when early Native Americans may have traveled or later settlers laid down their roots or traversed a trail in this vast wilderness. Often, especially during summer, I like to indulge myself with day trips on less-travelled routes, those hidden gems that may be a little off the beaten track, and less likely to be frequented by tourists, in hopes of ushering in such a time-traveling reverie. Each U.P. county has such spots. 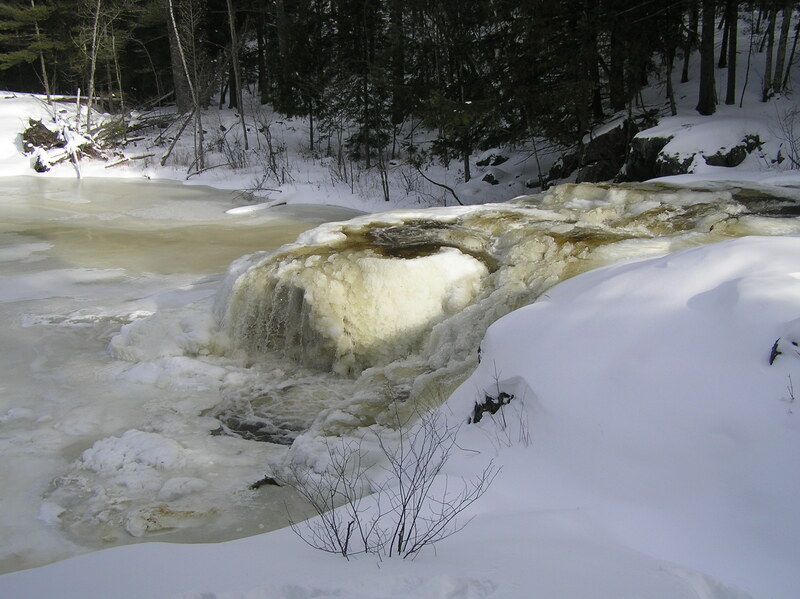 In Marquette County, for me, that spot is the Forestville Falls trail, located off Forestville Road, just eight minutes from the city of Marquette. The first thing you see from the parking lot is a fenced property owned by the Marquette Board of Light and Power, with a sign warning you of surveillance cameras and not to trespass into the generating facility. It’s letting you know to stay on the trail. There is an opening in the fence to follow a gravel path up an incline. Taken slowly and steadily, it brings you to the plateau from which you’ll see signage down the other side toward the flowage below. While the trail has had some improvements made to it over the years, it is not handicapped-accessible. Once you get down to the river, you are rewarded with rock formations likened to those found in Colorado and the West. Here you can enjoy the beauty of the area and have a picnic with friends or decide to explore further. The latter, however, will require crossing a creek over several logs. You can either stay at the base of the rock outcropping and proceed alongside the river, climbing over boulders at times to stay on the path, or you can take the other route, weaving uphill through the forest, until you get to a narrow path at the top on the edge of the cliff, overlooking the falls below. 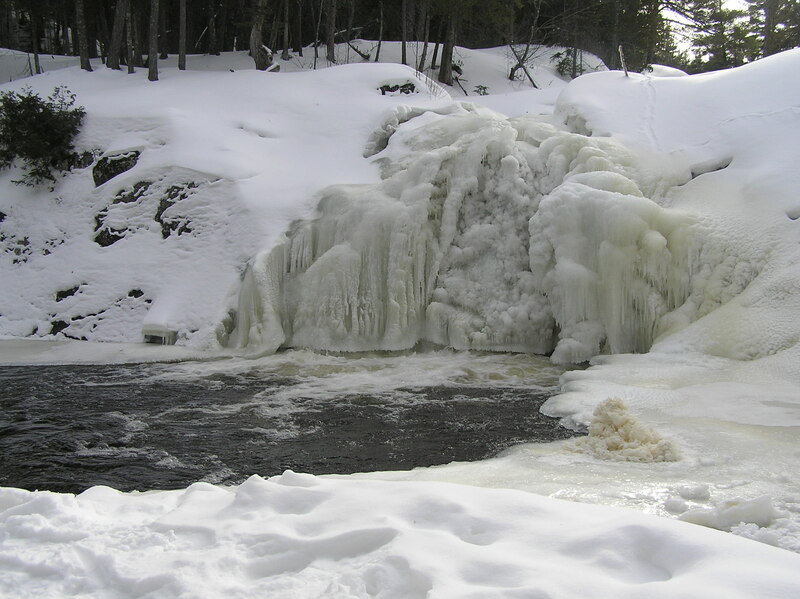 Once you get over and around this highland, both trails join back together, meandering along the river and through a series of waterfalls ranging from a few feet to approximately sixty feet high. This area is popular with the college crowd, which often can be found camping in the woods throughout this gorge, or swimming on sunny days in the various pools created between the cascades. After a rainfall, this area can be more dangerous to swim in, and even in the summer months, it’s quite chilly. This hike takes roughly two hours roundtrip at a steady pace. Most weekdays, you may be the only person there, but on weekends, plan on seeing other hikers, depending upon the weather. It’s a nice place to go on those extremely hot summer days since the trees combined with the ravine and water go a long way to cooling the temperatures, not to mention the mist and water particles floating in the air closer to the falls themselves. Forestville’s enchantments always prompt me to imagine Native Americans using these same trails in earlier times, as waterways and the paths beside them were the roads of yesteryear. When visiting Alger County, a hidden-in-plain-sight gem that is great for both nature lovers and history buffs is the Tyoga Trail. This historical pathway is less than two miles north of M-28 in Deerton, marked with a sign that easily can be overlooked. Imagine yourself back in the early 1900s, most likely working alongside an Englishman, Finn, or French Canadian Lumberjack. Work was hard, long, and dangerous. You’d be part of a crew that felled massive virgin pine trees, shaking the ground with thuds that could be felt throughout the town. Forty men were needed to run the mill. A huge steam engine operated the band saw. After an exhausting day in the woods, this rugged bunch would often begin drinking to soften sore muscles, escape the boredom and isolation of being away from family and friends, or bond with peers in this far-flung sawmill and town site. Alcohol-fueled fights frequently broke out. The new town of Tyoga sat alongside the Laughing Whitefish River where a virgin forest contained trees one-hundred-and-fifty feet tall and 3 1/2 pound brook trout were often pulled from the river. The town’s residents numbered 150 in its heyday, housed mostly in plank houses and log cabins. The town boasted a company store, blacksmith’s shop, boarding house, horse barns, and cook’s shanty in addition to the sawmill, and eventually a school and a post office. But then the mill was sold to Cleveland Cliffs, which dismantled and moved it, leading Tyoga to become another of the Upper Peninsula’s ghost towns after only about a decade in existence. The modern-day Tyoga Trail is easily walkable, with interpretive signs along the way making it a family-friendly adventure. Its 1.4-mile loop takes you through mostly hardwoods, but old growth pines can also be found, along with some foundations hidden among the overgrowth. You might even spot the graves of loggers accidently killed on the job, as well as remnants of the town’s railroad. How long you’ll be on the trail depends on whether you take time to read its many signs, and what the weather has been, as some parts can become quite muddy after rainfall. In Baraga County, our next “off-the-beaten-path” adventure takes place at the Hanka Family Homestead, settled in 1896 in an area later known as Askel Hill. This eighty-acre property was a subsistence farm, used primarily to provide food, heat, and water for survival. Around 1890, a number of recent Finnish immigrant woodcutters at Bootjack near Torch Lake heard there was a freshwater lake with abundant fish somewhere near Chassell. Two of them successfully set out and explored this densely forested wilderness, finding Otter Lake sitting between deep ravines and high hills. The lake reminded them of Finland, so they returned to Houghton in hopes of gaining possession of this beautiful area. Fortunately for them, Abraham Lincoln had signed into law the Homestead Act of 1862, so they were able to file their claims on September 13, 1890. Five families set out together via boat up the Sturgeon River, with the men following along the shore with cattle and a horse. In 1889, after becoming unable to work due to a mining accident, Herman Hanka decided to homestead in the Misery Bay-Toivola area on 160 acres, roughly twenty miles from Askel. After several years of isolation and hardship, the family decided to move once again, this time to the settlement on Otter Lake. In 1896, Herman’s older daughter, Mary, applied for a homestead and received it on the eighty acres where the farm is still preserved today. Records indicate the sauna and farmhouse were built first, followed by a log barn and a log root house. Five acres were fenced and farmed. The property also has a pond which was used in tanning leather. Can you envision yourself living as the Hanka family did, spending nearly all of your day working to meet your basic survival needs? Wondering whether you would have enough food to last through your next winter? Whether your clothes would be warm enough? Despite the challenges of modern life, it’s far easier in so many ways for most of us to access these basics. For more information and directions to experience the Hanka Homestead yourself, call the Keweenaw National Historic Park at (906) 337-3168 or visit http://www.hankahomesteadmuseum.org. 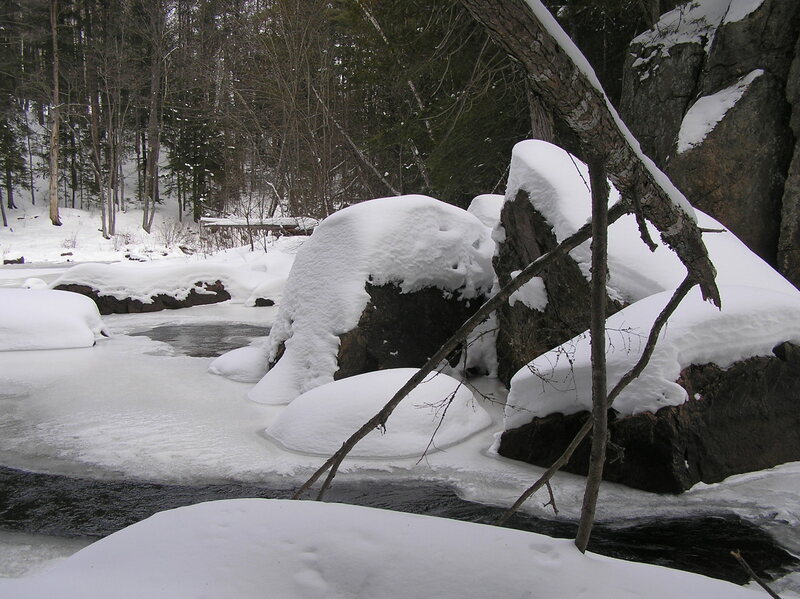 In Keweenaw County, a beautiful out-of-the-way hike where a person’s imagination might come alive is at Black Creek Nature Sanctuary. Within its 241-acres lies a 2.5 mile trail through a wide variety of landscapes, including sandy dunes with berries, meadows with wildflowers, and forest canopy of birch, balsam fir, maple and cedar. The path continues past beaver ponds and through conifers and hardwoods of various sizes. Arriving at Lake Superior, where Black Creek and Hills Creek come together to create a spectacular, continuously-changing lagoon, you can find remnants of the copper mining era along the shoreline from old stamp sand deposits, as well as non-magnetic black basalt sand, and an assortment of multi-sized rocks. This beach and creek area is also a hotspot for wildlife of all kinds – moose, wolves, beavers, black bears – and an aquatic home to various species of fish. Patient visitors will also enjoy watching a range of bird species in the canopy and on the shoreline. To reach the sanctuary from Calumet, take M-203 west and head north on Tamarack Waterworks Road. Veer right onto Cedar Bay Road. You’ll find a parking lot on the east, and the trailhead less than a quarter-mile south. Kevin McGrath can be found time-travelling through history on his journey through life. He can be reached with enough creativity or intention. Excerpt from Health & Happiness U.P. Magazine, Summer 2018 Issue, copyright 2018. I’m watching the Super Bowl and the running back takes the hand-off, racing to the right side where he sharply cuts upfield through the hole that his lineman opened for him. As he emerges from the hole, it quickly closes with a linebacker exploding into him. He astonishingly spins out of the tackler’s arms, keeping his footing and darting another five yards out of bounds, getting a key first down for his team. Two nights later, I’m watching my favorite hockey team, the Detroit Red Wings, on TV when Dylan Larkin catches a crisp pass on his stick, leaning hard into the defenseman who is all over him, all the while firing a bullet at the opposing team’s net. The next night, I’m at my Marquette City basketball game. At age fifty-nine, I play on a team with mostly 35 to 38-year-olds. We’re playing against the youngest team in the league, whose players average 28 years. We get a turnover and start a break-away during which a quick pass comes my way. It’s slightly deflected, causing me to spin my upper torso while running in the other direction. I lose my footing and fall hard to the ground as the ball bounces off my arm and out of bounds. Many factors come into play to achieve good balance, which requires the coordination of input from multiple sensory systems. These systems include but are not limited to sense organs, as well as pressure and vibratory senses, skin, joints, plus visual senses that all work in unity, detecting changes in spatial orientation in relation to the base of support, whether the body moves or the base is altered in some way. Environmental factors such as surface and lighting conditions, ear infections, alcohol, some medications, and other drug use also impact balance. As important as balance is, most people take it for granted. Have you ever misjudged the height of a curb while walking down the street, or caught your shoe on a raised crack in the sidewalk? There are various levels of stability, and while as an athlete, my ability to stay upright is pretty good, I’m still quite impressed by some of the people I see paddle boarding, snowboarding, surfing, downhill skiing or acrobatic skateboarding. Nonetheless, as with muscle tone, our balance typically declines with age. For example, my elderly aunt misjudged the second step going up to my brother’s house, lost her balance, and fell of the porch, breaking her hip. As a lifelong athlete and a former coach, it is clear to me that my balance isn’t what it used to be. I also realize there are a slew of ways to improve it. One favorite that comes to mind is the dot drill. I place four dots forming a square on the floor, roughly three feet apart with another dot in the middle of them all. I begin by standing on the middle dot and then jumping with both feet to the upper right dot and back to the middle, then to the lower right dot and back to middle, followed by the lower left dot and returning to the middle, then up to the upper left dot and back to the middle. I repeat this clockwise sequence three times, followed by the same movements in a counter-clockwise sequence three times. Once I’m able to do that confidently without pause, I work toward doing it with a one-legged hop, changing legs when I change direction from clockwise to counterclockwise. Zumba, yoga, tai chi or any other fitness class with trained professionals able to assist you in realizing your goals can also help you make great strides in improving your balance. Key here is finding what works best for you, whether done at home or with a group. For me, quality of life is essential, and that doesn’t happen by doing nothing. In order to improve, you must practice. That’s a good reminder to me. While we may automatically pay more attention to having a healthier diet, or working on muscle tone as we age, it’s extremely important to work on balance improvement too. Our quality of life lies in the balance. Kevin McGrath believes that life is a balancing act, physically, mentally, spiritually, and emotionally. He can be found stumbling his way through it. While many people are busy leveling their yards and trying to get the edges straight, spending countless hours making sure all the bushes and plants line up in a nice orderly fashion, clearing unwanted stones and dead wood, I am adding stones and wood, and creating surfaces both below and above ground level. In retrospect, I was inspired by several factors. All of my life I have been in love with both dead and decaying wood and stones. A friend recently told me she believes my stone crush stems from my Irish ancestry. After all, Ireland is a country built with stone – stone fences, cobblestone streets, buildings and castles of granite, and the fields are scattered with outcroppings of this natural rock. Each hardened sphere is unique in size, shape, color and weight. Especially when wet, their radiance shimmers and dances, exploding with a wide spectrum of color that tingles the senses. Dead and decaying wood are more subtly hued with grays and browns; however, they can often be seen joining forces with lichen and mosses to create a beautifully colored landscape. I have always enjoyed seeing downed branches or trees in their artistic poses, curving and twisting as if in a snapshot of a wooded kind of ballet. Unearthed roots especially excite me, as this secret dark society, which usually lives underground, is finally revealed for all to see. If my stone love stems from my Gaelic descent, then perhaps my wood infatuation is derived from my Native American roots. One can never be sure about these things of course, but I do know that decaying wood and stones have been favorites of mine since childhood. I know my most recent creative inspiration for incorporating these two natural wonders was inspired by a recent trip to New York’s Central Park. My son and I spent an afternoon there, frolicking along streams and through woods, up hills and down slopes, as we meandered along the winding paths. This trip inspired me to take the things I love and, in a micro sort of way, create this hobbit type world in my own backyard. Inspiration can come from all sorts of things, whether from within, where the genes of a distant relative seek expression, or a place that draws you in and makes an impression to the point that you want to recreate it in your own way in a nearby location, where you can see the things you love spread out before you. I believe the most important point, however, is to listen to these urges and see what they bring you. Given his fondness for sticks and stones, Kevin McGrath has been called by many names and is fine with that. Reprinted with permission from the Summer 2010 issue of Health & Happiness U.P. Magazine, copyright 2010. All rights reserved. *Join us for Myth-Busting & Self-Help Tips: YOUR Health & Happiness Forum, Saturday, Sept. 30th 2017, 1 pm – 4 pm in the Community Room on the lower level of the Peter White Public Library, Marquette, MI, and help us celebrate our 10th Anniversary. Click here for more info! **FOLLOW us here and/or on Facebook to be entered to WIN in our 10th Anniversary drawing! I am torn about writing the following, as the low number of people that use the area I’m about to describe is one reason it’s such a gem. We are often confronted with this catch-22 in the U.P., which has many treasured local spots we might hope to keep to ourselves. This selfishness is unhealthy and far too prevalent in current society. The Native American concept of un-ownable land makes good sense, allowing everyone to share in its abundance. So I’m going ahead and sharing information on one of my favorite hiking and cross-country ski trails which is hidden in plain sight – the Fit Strip, a half-mile by half-mile plot of land bordering Park Cemetery. On a first-of-spring jaunt through this easy, meandering trail winding past stunning white pines and other conifers, maples and birch, a jogger approached. He pointed and asked whether I saw the red fox grazing just fifty feet off the path. We both stopped and enjoyed the view for a moment before this sleek critter with a white patch on the tip of its full tail slipped back into denser thicket. The park is home to an array of four-legged foragers, including deer, skunk, raccoon, squirrel, chipmunk, and mouse. I’m always pleasantly surprised when I venture into this woodsy park. Nearly every year brings a new and exciting sighting. Once while traversing the soft wood chip trail, I turned a sharp corner and spotted a great horned owl a mere twenty feet away, busily devouring a chippy or mouse. He seemed perturbed by my sudden appearance, yet determined to finish his delectable meal. I stopped quickly and slowly backed away around the same corner so I could watch him without triggering his early departure. He turned his head toward me with an intensely fierce stare that penetrated my being, and then continued shredding the helpless rodent. Several years ago, a six-hundred pound moose yearling wandered into this forest haven and claimed it as home. Park Cemetery offers three beautiful ponds filled with water lilies, so this massive adolescent would sleep in the fit strip, forage, and then go to the pond to drink and feast. At first a handful of us watched his every move. Then the crowds grew each week until finally, after several months, hundreds would await his timely arrival. This gentle giant had to navigate through the crowds three times a day, causing concern from local authorities about possible danger. These crowds are not what I am seeking, but if you are looking for a close-to-home, nature-filled, peaceful adventure, this mid-city gem is worth the trip. It offers entrance from every side and trails that wind gracefully through a gently sloped city forest of endless nature-watching possibilities. To contact Kevin McGrath, see-male him hiking about enjoying the great outdoors. This article was reprinted with permission from the Spring 2014 issue of Health & Happiness U.P. Magazine, copyright 2014. All rights reserved. The last several days had been downright frigid, with temperatures hovering at zero and below. So when I looked outside on a mid-January Saturday and saw the sun shining, I knew I had to get outside to enjoy it. Twenty-three is what the thermometer was showing and like most of us living in these north woods would say, it felt like spring. So I jumped into my car and headed to the Dead River Falls where I usually enjoy a nice summer hike and also a fall excursion with all its colorful grandeur. This was actually my first trip to this hidden gem during the winter months. I was excited so I eagerly proceeded, camera in hand, wondering what this season had to offer. After climbing the somewhat steep but level snow-covered path leading to the trail head, it was clear the snow surely made it slower going. 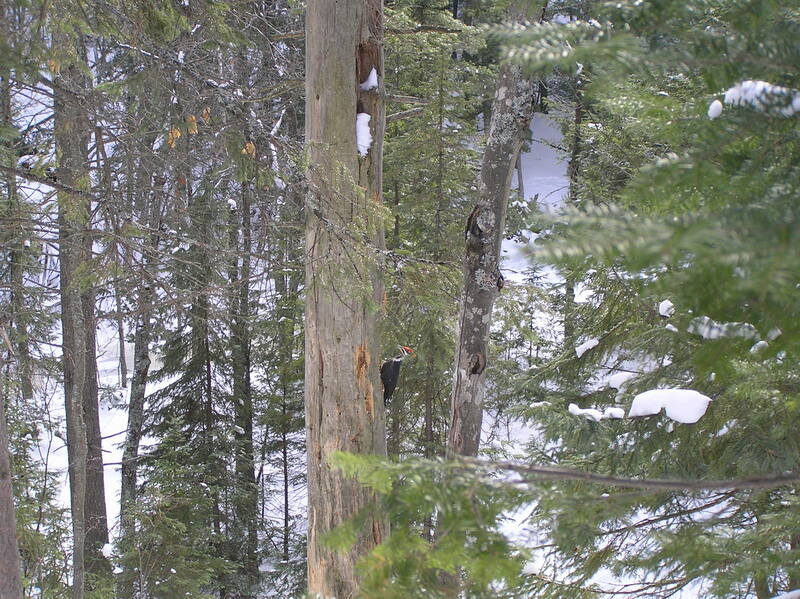 Upon entering the beginning of the trail, I was greeted by a pileated woodpecker busily chipping away at a tree in search of a mid-afternoon meal. He was working so hard he didn’t even notice me as I got my camera out and took several photos of his colorful plumage. I knew at that moment I was where I needed to be. Continuing on my way down the slope, I could hear the powerful flow of the water long before I could see it. Reaching the bottom of the hill, I entered an opening where the rushing life source was cap ped and blanketed with snowy-white curved and smooth drifts creating a beautiful landscape only seen in paintings. I took another picture. The air was fresh and pure, nourishing my olfactory senses as I proceeded upstream along the picturesque banks. Navigating a steep climb, I maneuvered myself to the top of the first of a series of waterfalls. I sat there quite a while, taking in all the splendor of the moment. After snapping several more photos, I continued my uplifting journey in this postcard-worthy adventure, reaching another series of iced-over falls whose gurgling, powerful, fast-moving liquid is only visible here and there at the very bottom, where openings from windblown snow hadn’t yet created the ice shelves that encased the rest. Wantin g to get closer but not being able to judge clearly where water and land divide, given all the drifting and covered surfaces, I slowly, cautiously, followed others’ footsteps on the trail I sat and listened to the winter birds busy above in the treetops. Soaking in this fine day, I continue a little further before deciding it was time to turn back and retrace my steps as the sun began slowly to sink and a chill that wasn’t around at the start of this local thrill became a noticeable temperature drop. Heading in the opposite direction brought new perspectives on this endeavor so I had to stop to take more photos. This popular summer haven for locals is now deserted, offering me this entire cornucopia of delight all to myself. I exited fully nourished, inspiration flowing through my veins like the water rushing over the hidden stones below. Kevin McGrath seeks inspiration wherever it is calling from, but particularly enjoys receiving it from nature. Tagged as Dead River Falls, Dead River Falls photos, Kevin mcGrath, Winter hiking, Winter Hiking in U.P.